Yu-ki Sugiyama and Sentaro Okamoto, "Catalytic [2 + 2 + 2] Cycloaddition Polymerization of Diyne–Nitrile Monomers in the Presence of CoCl2-6H2O/Diphosphine/Zn”, J. Polym. Sci. A: Polym. Chem. 2016, 54, 345-351.[Link]. Kouta Ibe, Haruko Aoki, Hiromasa Takagi, Kiyohide Ken-mochi, Yu-suke Hasegawa, Naoto Hayashi, and Sentaro Okamoto, "Preparation of 2-hydroxy A-ring precursors for synthesis of vitamin D3 analogues from lyxose”,Tetrahedron Letters, 2015, 56, 2315-2318[Link]. Takeshi Hanazawa, Akiko Koyama, Kunio Nakata, Sentaro Okamoto, Fumie Sato, "New Convergent Synthesis of 1alfa,25-Dihydroxyvitamin D3 and Its Analogues by Suzuki-Miyaura Coupling between A-ring and C,D-ring Parts", J. Org. Chem., 2003, 68, 9767-9772. 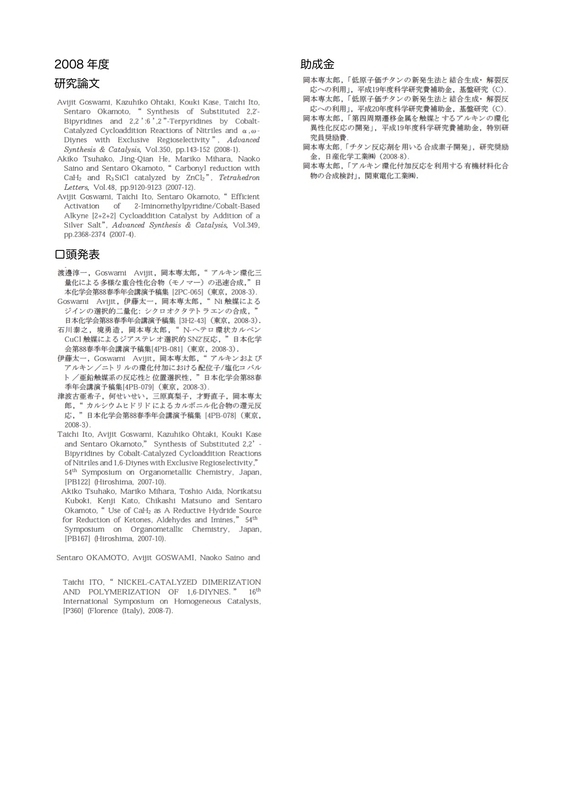 Takeshi Hanazawa, Akiko Koyama, Takeshi Wada, Eiko Morishige, Sentaro Okamoto, Fumie Sato, "Efficient Convergent Synthesis of 1alfa,25-Dihydroxyvitamin D3 and Its Analogues by Suzuki-Miyaura Coupling", Organic Letters, 2003, 5, 523-525. See also the correction: 2003, 5, 3167. Yongcheng Song, Sentaro Okamoto, Fumie Sato, "A concise asymmetric synthesis of 5,8-disubstituted indolizidine alkaloids. Total synthesis of (-)-indolizidine 209B", Tetrahedron Letters, 2002, 43, 8635-8637. Kwangho Kim, Sentaro Okamoto, Yuuki Takayama, Fumie Sato, "Asymmetric synthesis of stereodefined alfa-alkyl-gamma-benzyloxymethyl-beta-trimethylsilyl-gamma-butyrolactones that serve as an efficient precursor for constructing carbon skeletons having a tertiary or quaternary stereogenic center", Tetrahedron Letters, 2002, 43, 4237-4239. Subburaj Kandasamy, Sentaro Okamoto, Fumie Sato, "Development of New Chiral Building Blocks for Synthesis of Bicyclo[3.3.0]octane Compounds", J. Org. Chem., 2002, 67, 1024-1026. Takeshi Hanazawa, Takeshi Wada, Tomoko Masuda, Sentaro Okamoto, and Fumie Sato, "Novel Synthetic Approach to 19-nor-1alfa,25-Dihydroxyvitamin D3 and its Derivatives by the Suzuki-Miyaura Coupling in Solution and on Solid Support", Organic Letters, 2001, 3, 3975-3977. Yongcheng Song, Sentaro Okamoto, and Fumie Sato, "Highly Stereoselective Asymmetric Construction of an Acyclic Carbon Skeleton Having Two Adjacent Alkyl Substituents by Michael Addition of Optically Active Allenyltitaniums to Alkylidenemalonates", Organic Letters, 2001, 3, 3543-3545. Sentaro Okamoto, Shin-ichiro Matsuda, Duk Keun An, Fumie Sato, "General synthetic method for preparation of optically active propargyl and allenylstannanes", Tetrahedron Letters, 2001, 42, 6323-6326. Sentaro Okamoto, Fumie Sato, "A Highly Efficient and Practical Preparation of 2,4-Pentadienyltitaniums and their gamma-Selective Addition Reaction with Aldehydes and Ketones", J. Organomet. Chem., 2001, 624, 151-156. Takeshi Hanazawa, Hajime Inamori, Tomoko Masuda, Sentaro Okamoto, Fumie Sato, "Efficient and Practical Synthesis of the A-Ring Precursor of 19-nor-1alfa,25-Dihydroxyvitamin D3 and its 13C- or 2H-Labeled Derivative", Organic Letters. 2001, 3, 2205-2207. Xin Teng, Takeshi Wada, Sentaro Okamoto, Fumie Sato, "One-pot preparation of 2-substituted and 2,3-disubstituted furans from 2-alkynal tetramethylethylene acetals and aldehydes using a divalent titanium reagent Ti(O-i-Pr)4/2 i-PrMgX", Tetrahedron Lett., 2001, 42, 5501-5503. Takeshi Hanazawa, Sentaro okamoto, Fumie Sato, "Chemical synthesis of optically active cis-cyclohexa-3,5-diene-1,2-diols and their 5-2H-derivatives", Tetrahedron Lett., 2001, 42, 5455-5457. Sentaro Okamoto, Kandasamy Subburaj, Fumie Sato, "Ti(II)-Mediated Tandem Inter- and Intramolecular Coupling Reaction of Unsaturated Hydrocarbons: One-pot Preparation of Cyclopentanes and Cyclohexanes from Readily Available Acyclic Starting Materials", J. Am. Chem. Soc., 2001, 123, 4857-4858. Sentaro Okamoto, Xin Teng, Shintaro Fujii, Yuuki Takayama, Fumie Sato, "An Allyltitanium Derived from Acrolein 1,2-Dicyclohexylethylene Acetal and ( eta2-propene)Ti(O-i-Pr)2 as a Chiral Propionaldehyde Homoenolate Equivalent Which Reacts with Imines with Excellent Stereoselectivity. An Efficient and Practical Access to Optically Active -Amino Carbonyl Compounds", J. Am. Chem. Soc., 2001, 123, 3462-3471. Kwangho Kim, Sentaro Okamoto, Fumie Sato, "Regiocontrol of Radical Cyclization by Lewis Acids. Efficient Synthesis of Optically Active Functionalized Cyclopentanes and Cyclohexanes", Organic Letters, 2001, 3, 67-69. Sentaro Okamoto, Kohki Fukuhara, Fumie Sato, "An Efficient and Practical Preparation of Optically Active syn-1-Vinyl-2-amino Alcohol Derivatives by the Regio- and Diastereoselective Addition Reaction of ( alfa-Alkoxyallyl)titaniums with Chiral Imines. Formal Synthesis of Statine", Tetrahedron Letters, 2000, 41, 5561-5565. Takeshi Hanazawa, Sentaro Okamoto, Fumie Sato, "Preparation of Titanated Alkoxyallenes from 3-Alkoxy-2-propyn-1-yl Carbonates and (eta2-Propene)Ti(O-i-Pr)2 as an Efficient Ester Homoaldol Equivalent", Organic Letters, 2000, 2, 2369-2371. Sentaro Okamoto, Kandasamy Subburaj, Fumie Sato, "Highly Stereocontrolled Synthesis of Carbacyclin from Acyclic Starting Materials via Ti(II)-Mediated Tandem Cyclization", J. Am. Chem. Soc., 2000, 122, 11244-11245. Sentaro Okamoto, Tuuki Takayama, Yuan Gao, Fumie Sato, "One-pot Synthesis of a Variety of 1,4-Alkadienes and 1,2,4-Alkatrienes from Alkynes, Allyl, or Propargyl Compounds and Electrophiles by a ( eta2-propene)Ti(O-i-Pr)2-Mediated Reaction", Synthesis, 2000, 975-979. Xin Teng, Yuuki Takayama, Sentaro Okamoto, and Fumie Sato, "Development of a Chiral Propionaldehyde Homoenolate Equivalent Which Reacts with Imines with Excellent Stereoselectivity. Efficient and Practical Synthesis of Optically Active gamma-Amino Carbonyl Compounds", J. Am. Chem. Soc., 1999, 121, 11916-11917. Yuuki Takayama, Sentaro Okamoto, Fumie Sato, "Titanium(II)-mediated Asymmetric Intramolecular Cyclization of 2,7- and 2,8-Enynyl Chiral Acetals. Synthetic Equivalent of Stoichiometric Intramolecular Asymmetric Metallo-Ene Reaction", J. Am. Chem. Soc., 1999, 121, 3559-3560. Duk Keun An, Koichiro Hirakawa, Sentaro Okamoto, Fumie Sato, "Electrophilic Amination of Racemic and Non-racemic Allenyltitaniums. One-pot Synthesis of alfa-Hydrazino-alkynes from Propargylic Alcohol Derivatives", Tetrahedron Letters, 1999, 40, 3737-3740. Masaaki Shirai, Sentaro Okamoto, Fumie Sato, "Practical Synthesis of Optically Active Bicyclic Oxazolidinylpiperidines, Chiral Building Blocks for Preparing 1-Deoxyazasugars, from Serine", Tetrahedron Letters, 1999, 40, 5331-5332. Sentaro Okamoto, Duk Keun An, Fumie Sato, "Synthesis of Optically Active Allenyltitaniums Having Axial Chirality by the Reaction of Optically Active Propargylic Compounds with a Ti(O-i-Pr)4/2i-PrMgCl Reagent", Tetrahedron Letters, 1998, 39, 4551-4554. Duk Keun An, Sentaro Okamoto, Fumie Sato, "Synthesis of Chiral Alkynes Having 2H or Halogen at the Secondary or Tertiary Propargylic Stereogenic Center by Hydrolysis and Halogenolysis of Optically Active Allenyltitaniums Having Axial Chirality", Tetrahedron Letters, 1998, 39, 4555-4558. Duk Keun An, Sentaro Okamoto, Fumie Sato, "Efficient One-Pot Synthesis of Propargylstannanes from Propargylic Alcohol Derivatives via Allenyltitaniums", Tetrahedron Letters, 1998, 39, 4861-4864. Teng Xin, Sentaro Okamoto, Fumie Sato, "1,5-Asymmetric Induction in Addition Reaction of Aldehydes with Chiral Allyltitaniums Having an Amino Group at the Stereogenic Center. Synthesis of Optically Active 2,6-cis-Disubstituted Piperidines", Tetrahedron Letters, 1998, 39, 6927-6930. Shin-ichiro Matsuda, Duk Keun An, Sentaro Okamoto, Fumie Sato, "An Efficient Method for Conversion of 1-Alken-3-yl Carbonates to 1-Alkenes and 3-Chloro-1-alkenes via Allyltitaniums", Tetrahedron Letters, 1998, 39, 7513-7516. Sentaro Okamoto, Masayuki Iwakubo, Katsushige Kobayashi, Fumie Sato, "Efficient and Practical Method for Synthesizing N-Heterocyclic Compounds Using Intramolecular Nucleophilic Acyl Substitution Reactions Mediated by Ti(O-i-Pr)4/2 i-PrMgX Reagent. Synthesis of Quinolones, Pyrroles, Indoles, and Optically Active N-Heterocycles Including Allopumiliotoxin Alkaloid 267A", J. Am. Chem. Soc., 1997, 119, 6984-6990. Yuuki Takayama, Sentaro Okamoto, Fumie Sato, "Stereoselective Synthesis of Optically Active Substituted Piperidines and Pyrrolidines from Amino Acid Derivatives by Titanium(II)-Mediated Intramolecular Cyclization Reaction", Tetrahedron Letters, 1997, 38, 8351-8354. Xin Teng, Aleksandr Kasatkin, Yasufumi Kawanaka, Sentaro Okamoto, Fumie Sato, "Synthesis of Chiral Allyltitaniums Having an Amino Group at the C-4 Position and Their Diastereoselective Addition Reaction with Aldehydes", Tetrahedron Letters, 1997, 38, 8977-8980. Yasufumi Kawanaka, Naoya Ono, Yukio Yoshida, Sentaro Okamoto, Fumie Sato, "Synthesis of the Key Component for Preparation of 6-Keto-prostaglandins by a Two-Component Coupling Process: Synthesis of 6-Keto-Prostaglandin E1, Ornoprostill and delta2-trans-6-Keto-Prostaglandin E1. ", J. Chem. Soc., Perkin Trans. 1, 1996, 715-718. Sentaro Okamoto, Aleksandr Kasatkin, P. K. Zubaidha, Fumie Sato, "Intramolecular Nucleophilic Acyl Substitution Reactions Mediated by XTi(O-i-Pr)3 (X=Cl, O-i-Pr)/2 i-PrMgBr Reagent. Efficient Synthesis of Functionalized Organotitanium Compounds from Unsaturated Compounds", J. Am. Chem. Soc., 1996, 118, 2208-2216. Aleksandr Kasatkin, Katsushige Kobayashi, Sentaro Okamoto, Fumie Sato, "Synthesis of 1-Hydroxybicyclo[n.1.0]alkanes (n = 3 and 4) and Their Silyl Ethers from Olefinic Esters via Tandem Intramolecular Nucleophilic Acyl Substitution and Intramolecular Carbonyl Addition Reactions Mediated by Ti(OPr-i)4/2 i-PrMgCl Reagent", Tetrahedron Letters, 1996, 37, 1849-1852. Sentaro Okamoto, Hiroyoshi Sato, Fumie Sato, "Highly Efficient Synthesis of Alka-1,3-dien-2-yltitanium Compounds from Alka-2,3-dienyl Carbonates. A New, Practical Synthesis of 1,3-Dienes and 2-Iodo-1,3-dienes", Tetrahedron Letters, 1996, 37, 8865-8868. Yukio Yoshida, Sentaro Okamoto, Fumie Sato, "Intramolecular Nucleophilic Acyl Substitution Reaction of 3,4-Alkadienyl Carbonates Mediated by Ti(O-i-Pr)4/2 i-PrMgCl Reagent. Efficient Synthesis of Optically Active β,γ-Unsaturated Esters with an α-Substituent", J. Org. Chem., 1996, 61, 7826-7831. Yukio Yoshida, Yoshitaka Sato, Sentaro Okamoto, Fumie Sato, "An Efficient Approach to Optically Active Benzoprostacyclins by a Two-Component Coupling Process", J. Chem. Soc., Chem. Commun., 1995, 811-812. Aleksandr Kasatkin, Sentaro Okamoto, Fumie Sato, "Intramolecular Nucleophilic Acyl Substitution Reactions Mediated by Ti(OPr-i)4/2 i-PrMgBr Reagent. Synthesis of Vinyltitanium Compounds Having a Lactone and/or an Ester Group from Acetylenic Carbonates", Tetrahedron Letters, 1995, 36, 6075-6078. Aleksandr Kasatkin, Takashi Nakagawa, Sentaro Okamoto, Fumie Sato, "New, Efficient Method for the Synthesis of Allyltitanium Compounds from Allyl Halides or Allyl Alcohol Derivatives via Oxidative Addition. A Highly Efficient and Practical Synthesis of Homoallyl Alcohols", J. Am. Chem. Soc., 1995, 117, 3881-3882. Sentaro Okamoto, Naoya Ono, Kousuke Tani, Yukio Yoshida, Fumie Sato, "Conversion of Allyl-2-Ynoates to Alk-2-Ynoic Acids Using Morpholine and Palladium(0)-Bis(diphenylphosphino)Alkane Catalyst; Synthesis of 2,2,3,3-Tetradehydro PGE1", J. Chem.Soc., Chem. Commun., 1994, 279-280. Kousuke Tani, Naoya Ono, Sentaro Okamoto, Fumie Sato, "Palladium(0)-Catalysed Transfer Hydrogenation of Alkynes to cis-Alkenes with HCO2H-NEt3", J. Chem. Soc., Chem. Commun., 1993, 386-387. Kousuke Tani, Yoshitaka Sato, Sentaro Okamoto, Fumie Sato, "Synthesis of Optically Active Furfuryl Alcohols and Butenolides from trans-1-Trimethylsilyl-3-Alken-1-ynes via Successive Asymmetric Dihydroxylation and Hydromagnesiation Reactions", Tetrahedron Letters, 1993, 34, 4975-4978. Naoya Ono, Yukio Yoshida, Kousuke Tani, Sentaro Okamoto, Fumie Sato, "A Highly Efficient Approach to Prostaglandins via Radical Addition of alfa Side-Chains to Methylenecyclopentanones. Total Synthesis of Natural PGE1, Limaprost and New Prostaglandin Derivatives. ", Tetrahedron Letters, 1993, 34, 6427-6430. Sentaro Okamoto, Satoshi Katayama, Naoya Ono, Fumie Sato, "A New Efficient Synthesis of the Biologically Potent PGD2-Analogue ZK118182", Tetrahedron: Asymmetry, 1992, 3, 1525-1528. Naoya Ono, Mie Tsuboi, Sentaro Okamoto, Tohru Tanami, Fumie Sato, "Synthesis of Allyl Ester of Prostaglandin E and the Conversion of the Allyl Ester Moiety into Carboxylic Acid by Chemical Method. A Highly Practical Synthesis of Natural PGE1 and Limaprost", Chemistry Letters, 1992, 2095-2098. Sentaro Okamoto, Toshiharu Yoshino, Hiromi Tsujiyama, Fumie Sato, "Highly Efficient and General Method for Synthesis of Tertiary Allylic Alcohols in a Chiral Form. Synthesis of Arbaprostil", Tetrahedron Letters, 1991, 32, 5793-5796. Sentaro Okamoto, Hiromi Tsujiyama, Toshiharu Yoshino, Fumie Sato, "Synthesis of Optically Active gmma-Trimethylsilyl-beta, gamma-Epoxy Tertiary Alcohols by the Diastereoselective Addition Reaction of beta-Trimethylsilyl-alfa, beta-Epoxyketones with Grignard Reagents", Tetrahedron Letters, 1991, 32, 5789-5792. Toshiharu Yoshino, Sentaro Okamoto, Fumie Sato, "Highly Efficient Synthesis of 13-Dehydroprostaglandins by 1,4-Addition Reaction of Alkynyl omega Side-Chain Unit onto Cyclopentenone Framework", J. Org. Chem., 1991, 56, 3205-3207. Sentaro Okamoto, Toshiharu Yoshino, Fumie Sato, "A Practical Synthesis of the omega Side-Chain Unit Present in Mexiprostil and Its Use for Synthesis of Mexiprostil via Two-Component Coupling Process", Tetrahedron: Asymmetry, 1991, 2, 35-38. Takayori Ito, Isao Yamakawa, Sentaro Okamoto, Yuichi Kobayashi, Fumie Sato, "A New Stereoselective Method for Synthesis of Optically Active beta-Alkylhomoallyl Alcohols and gamma, delta-Epoxy-beta-Alkyl Alcohols", Tetrahedron Letters, 1991, 32, 371-374. Takayori Ito, Sentaro Okamoto, Fumie Sato, "Synthesis of Optically Active alfa-Trimethylsilyl delta alfa,beta-Butenolides and their Conversion into Various Butenolides and Saturated gamma-Lactones", Tetrahedron Letters, 1990, 31,, 6399-6402. Hiromi Tsujiyama, Naoya Ono, Toshiharu Yoshino, Sentaro Okamoto, Fumie Sato, "A Highly Practical Synthesis of Natural PGE1, delta2-Trans-PGE1 and 2,2,3,3-Tetrade-Hydro-PGE1 via Two-Component Coupling Process Using Zinc-Copper Reagents", Tetrahedron Letters, 1990, 31, 4481-4484. Takayori Ito, Sentaro Okamoto, Fumie Sato, "Practical Method for Synthesis of Optically Pure Propargylic Alcohols", Tetrahedron Letters, 1989, 30, 7083-7086. Yasunori Kitano, Sentaro Okamoto, Fumie Sato, "A New Method for the Synthesis of Protected Chiral 4-Hydroxy-2-Cyclopentenone", Chemistry Letters,1989, 21 63-2164. Sentaro Okamoto, Yuichi Kobayashi, Fumie Sato, "A Highly Efficient Synthesis of Natural PGE3 and 5,6-Dihydro PGE3 via Two-Component Coupling Process", Tetrahedron Letters, 1989, 30, 4379-4382. Sentaro Okamoto, Yuichi Kobayashi, Hiroshi Kato, Kimihiko Hori, Takashi Takahashi, Jiro Tsuji, Fumie Sato, "Prostaglandin Synthesis via Two-Component Coupling. Highly Efficient Synthesis of Chiral Prostaglandin Intermediates 4-Alkoxy-2-Alkyl-2-Cyclopenten-1-one and 4-Alkoxy-3-Alkenyl-2-Methylenecyclopentan-1-one", J. Org. Chem., 1988, 53, 5590-5592. Yasunori Kitano, Takashi Matsumoto, Takenori Wakasa, Sentaro Okamoto, Toshiyuki Shimazaki, Yuichi Kobayashi, Fumie Sato, Katsuaki Miyaji, Kazutaka Arai, "A Highly Efficient Synthesis of Optically Pure gamma-iodo Allylic Alcohols and their Conversion into Various Optically Active Allylic Alcohols", Tetrahedron Letters, 1987, 28, 6351-6354. Yuichi Kobayashi, Sentaro Okamoto, Toshiyuki Shimazaki, Yoshinori Ochiai, Fumie Sato, "Synthesis and Physiological Activities of Both Enantiomers of Coriolic Acid and their Geometric Isomers", Tetrahedron Letters, 1987, 28, 3959-3962. Yasunoi Kitano, Takashi Matsumoto, Sentaro Okamoto, Toshiyuki Shimazaki, Yuichi Kobayashi, Fumie Sato, "A Highly EfficientrSynthesis of Prostaglandin omega-Chain Precursors", Chemistry Letters, 1987, 1523-1526. Sentaro Okamoto, Toshiyuki Shimazaki, Yuichi Kobayashi, Fumie Sato, "A Highly Efficient Synthesis of gamma-Halo Allylic and Propargylic Alcohols with High Optical Purity. Practical Method for Synthesis of the Prostaglandin omega-Chain", Tetrahedron Letters, 1987, 28, 2033-2036. Sentaro Okamoto, Toshiyuki Shimazaki, Yasunori Kitano, Yuichi Kobayashi, Fumie Sato, "A Practical Preparation of alfa-Hydroxy and alfa,beta-Dihydroxy Aldehydes, Useful Intermediates for the Synthesis of Arachidonic Acid Metabolites, Starting with D-Glyceraldehyde Acetonide", J. Chem. Soc., Chem. Commun., 1986, 1352-1355. Sentaro Okamoto, “Possibility of catalytic reaction control of organic typical metals with strong Lewis bases”, Organometallic News, 2009, 67. 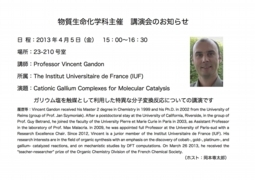 Sato, Fumie; Urabe, Hirokazu; Okamoto, Sentaro, “Synthetic reactions with divalent titanium complex”, Yuki Gosei Kagaku Kyoukaishi,1998, 56, 424-432.[Link]. Sentaro Okamoto, “Development of selective and practical synthetic reactions using group IV metals”, Kanagawa Daigaku Kogakubu Hokoku (2008), 46, 91-96. Tobiyuki Ikehara, Sentaro Okamoto, “Organic materials spectral diffraction and micromeasurement system”, Kanagawa Daigaku Kogakubu Hokoku (2008), 46, 69-71. Sentaro Okamoto. “Organotitanium reagents applicable to stoichiometric synthetic processes”, Kanagawa Daigaku Kogakubu Hokoku (2003), 41, 20-23. 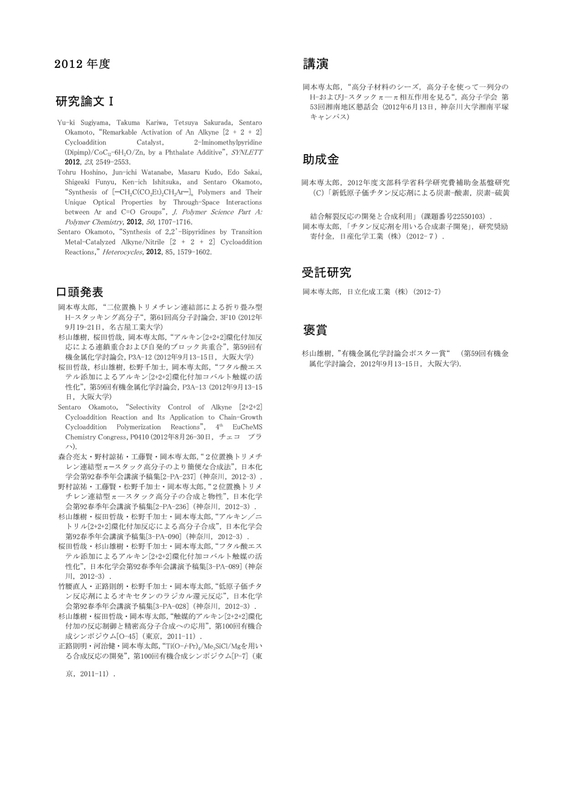 Sentaro Okamoto, “Asymmetric synthesis of allenyl organometallics and their synthetic utility: chemistry of axially chiral allenyltitanium complexes”, Kanagawa Daigaku Kogaku Kenkyusho Shoho (2002), 25, 70-76. Funyuu, Shigeaki and Asano, Naoki and Ishizuka, Kenichi and Okamoto, Sentaro. 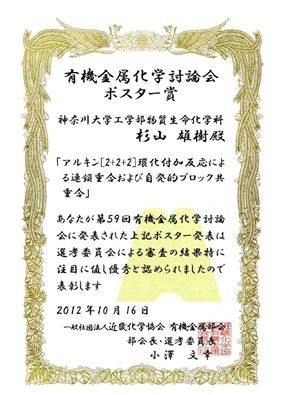 "Organic photoelectric converter having polymer with arylene-C3 chain-arylene repeating unit and its manufacture", Jpn. Kokai Tokkyo Koho (2013) JP2013070000A. Funyuu, Shigeaki; Ishitsuka, Kenichi; Nakako, Hideo; Okamoto, Sentaro, “Compound having trimethylene structure, polymer compound containing unit that has trimethylene structure, and reactive compound having trimethylene structure”, PCT Int. Appl. (2011), WO 2011093463 A1 20110804. Okamoto, Sentaro, “Process for production of substituted benzene derivatives”, PCT Int. Appl. (2007), WO 2007080837 A1 20070719. 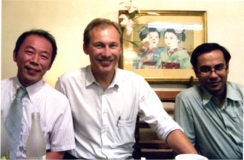 Sato, Fumie; Okamoto, Sentaro, “Preparation of vitamin D derivatives”, Jpn. Kokai Tokkyo Koho (2003), JP 2003327575 A 20031119. Sato, Fumie; Okamoto, Sentaro, “Halovinylidenemethylenecyclohexane compounds, borovinylidenemethylenecyclohexane compounds, and process for producing vitamin D derivative from them”, PCT Int. Appl. (2003), WO 2003074480 A1 20030912. Sato, Fumie; Okamoto, Sentaro, “Optically active dihydroxycyclohexane compounds and process for producing optically active hydroxyethylenedihydroxycyclohexane compounds”, PCT Int. Appl. (2003), WO 2003031455 A1 20030417. 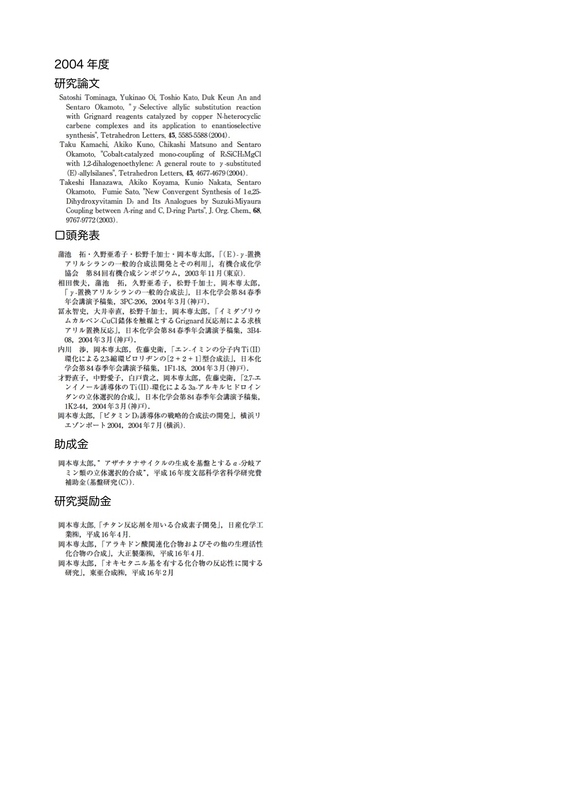 Sato, Fumie; Okamoto, Sentaro, “Process for preparation of 19-norvitamin D derivatives”, PCT Int. Appl. (2003), WO 2003031402 A1 20030417. Sato, Fumie; Okamoto, Sentaro, “Process for preparation of 19-norvitamin D derivatives by cross-coupling reaction of 2-(bromomethylene)-1,3-dihydroxycyclohexane derivatives with vinylboronic acid derivatives or acetylene derivative”, PCT Int. Appl. (2003), WO 2003031401 A1 20030417. Sato, Fumimori; Okamoto, Sentaro, “Preparation of trans-1,2-diarylethanediamines”, Jpn. Kokai Tokkyo Koho (2002), JP 2002338531 A 20021127. Sato, Fumie; Okamoto, Sentaro, “Preparation of optically active cyclohexenes as intermediates for active vitamin D derivatives”, Jpn. Kokai Tokkyo Koho (2002), JP 2002201150 A 20020716. Takahiro SHINDO, Yusuke NAITO, Ayuri NISHIZAWA, Chikashi MTSUNO, Sentaro OKAMOTO, “Synthesis and Hole-Mobility of Folded π-Stacking Polymers”, 日本化学会第96春季年会，3PC-124 (2016年3月26日，同志社大学（京都）. 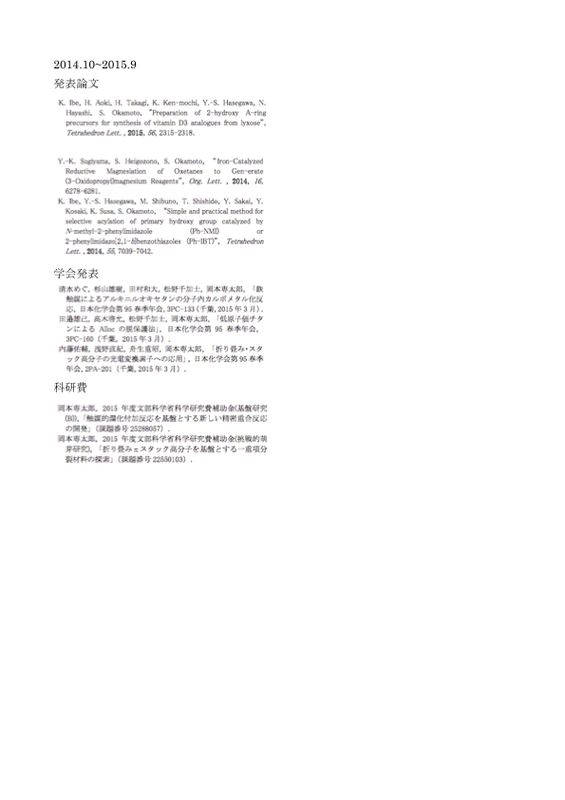 Yu-ki SUGIYAMA, Yukihiro ENDO, Miki IKARASHI, Chikashi MTSUNO, Sentaro OKAMOTO, “Extensive Application of Cobalt-Catalyzed [2+2+2] Cycloaddition of Alkynes and Nitriles”, 日本化学会第96春季年会，3PC-081 (2016年3月26日，同志社大学（京都）. 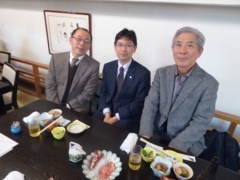 Yuhma UMEHARA, Shunnosuke ITO, Tomomi SAWADA, Chikashi MTSUNO, Sentaro OKAMOTO, “Low-valent Titanium-Mediated Biscyclization of Enynes and Ethyl Formate”, 日本化学会第96春季年会，3PC-075 (2016年3月26日，同志社大学（京都）. 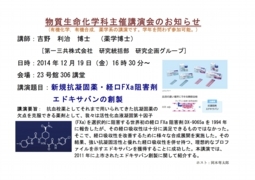 Yukihiro ENDO, Yusuke NAITO, Ryouhei SHIGEMATSU, Chikashi MTSUNO, Sentaro OKAMOTO, “Low-valent Titanium Alkoxide-Mediated McMurry Coupling Polymerization”, 日本化学会第96春季年会，3PC-074 (2016年3月26日，同志社大学（京都）. 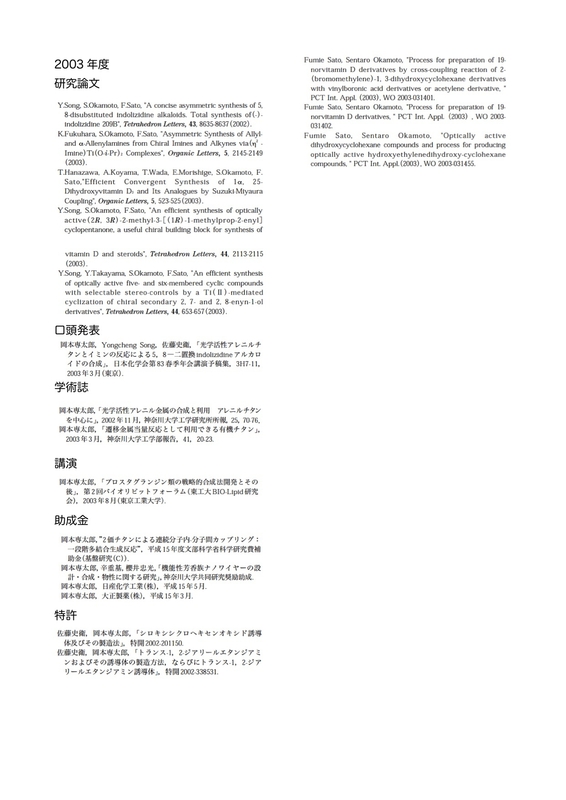 Suchithra MADHAVAN, Hiromasa TAKAGI, Shupei FUKUDA, Chikashi MTSUNO, Sentaro OKAMOTO, “Low-valent Titanium-Promoted Deprotection of Amino-Protecting Groups”, 日本化学会第96春季年会，3PC-073 (2016年3月26日，同志社大学（京都）. Yuhki Tanabe, Yu-ki Sugiyama, Shiori Heigozono, Kazuhiro Tamura, and Sentaro Okamoto, “Iro-catalyzed reductive magnesiation of oxetanes and metalative cyclization of alkynyl oxetanes”, INOR 1290, PacifiChem 2016, Hawaii (2015年12月15-20日). Yuhsuke Naito, Chikashi Matsuno, and Sentaro Okamoto, “Synthesis and properties of folded π-stacking polymers and their utilization to organic photovoltaic cell”, MACR 512, PacifiChem 2016, Hawaii (2015年12月15-20日). Suchithra Madhavan, Hiromasa Takagi, Chikashi Matsuno, and Sentaro Okamoto, “Low-valent titanium catalyzed deprotection of alloc- and poc-amides”, INOR 1213, PacifiChem 2016, Hawaii (2015年12月15-20日). 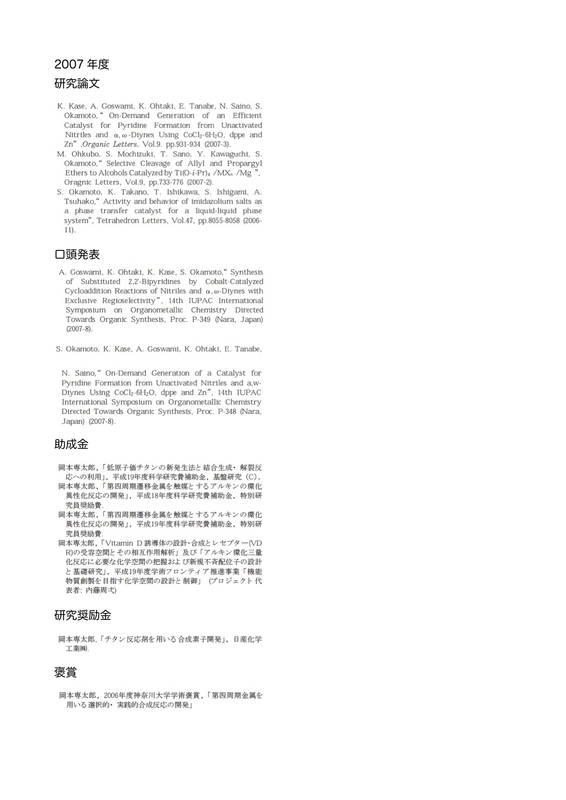 Sentaro Okamoto, “Selectivity Control of Alkyne [2+2+2] Cycloaddition Reaction and Its Application to Chain-Growth Cycloaddition Polymerization Reactions”, 4th EuCheMS Chemistry Congress, P0410 (2012年8月26-30日，チェコ　プラハ). 工藤　賢・星野　暢・野村　諒祐・岡本　専太郎, “マロン酸エステルを連結部とする非連結部π型高分子の合成”, 日本化学会第91春季年会講演予稿集[2-PB-035]（横浜，2011-3）. 桜田哲哉・杉山雄樹・加藤令・岡本専太郎, “Co触媒アルキン[2 + 2 + 2]環化付加反応による連鎖重付加とその応用”, 日本化学会第91春季年会講演予稿集[2-PB-050]（横浜，2011-3）. 杉山雄樹・桜田哲哉・加藤令・岡本専太郎, “Co触媒アルキン[2 + 2 + 2]環化付加反応による連鎖重付加”, 日本化学会第91春季年会講演予稿集[1-C8-14]（横浜，2011-3）. Y. Sugiyama, C. Takegoshi, S. Okamoto, “Utilization of alkyne [2+2+2] cycloaddition reactions to macromolecule synthesi”,　2010 International Chemical Congress of Pacific Basin Societies (USA, Hawaii, 2010-12). 林　直斗, 津波古亜希子, 中山里菜, 岡本専太郎，“oxa型C,D環部を有するステロイドおよびビタミンD誘導体の合成研究”, 日本化学会第８９春季年会講演予稿集[2PC-024]（千葉，2009-3）. 境勇三, 白鳥めぐみ, 宍戸司, 渋野美寿々, 岡本専太郎，“アシル化触媒縮環ベンゾチアゾールアミンの置換基効果”, 日本化学会第８９春季年会講演予稿集[2PC-029]（千葉，2009-3）. 杉山雄樹, 東亭涼, 青山嘉義, 野村彩美, 岡本専太郎，“アルキン[2 + 2 + 2]環化付加触媒Dipimp/CoCl2/Znの高分子合成反応への適用”, 日本化学会第８９春季年会講演予稿集[3PA-011]（千葉，2009-3）. 渡邊淳一, 星野暢, 酒井慧斗, 中村祐介, 岡本専太郎，“折り畳み型πスタックオリゴマーおよびポリマーの合成と物性”, 日本化学会第８９春季年会講演予稿集[3PA-022]（千葉，2009-3）. 星野暢, 渡邊淳一, 中村祐介, 岡本専太郎，“CH2-SiMe2-CH2をtetherとするskipped-πオリゴマーおよびポリマーの合成と物性”, 日本化学会第８９春季年会講演予稿集[3PA-023]（千葉，2009-3）. 河治健, 境勇三, 何せいせい, 岡本専太郎，“CaH2/ZnX2反応剤による還元反応”, 日本化学会第８９春季年会講演予稿集[3PC-102]（千葉，2009-3）. 石川泰之, 柴田佳美, 松野千加士, 岡本専太郎，“イミダゾリウム塩触媒Grignardアリル置換反応”, 日本化学会第８９春季年会講演予稿集[3PC-115]（千葉，2009-3）. 大野千隼, 何せいせい, 大岩裕志, 松野千加士, 岡本専太郎，“低原子価チタン反応剤Ti(O-i-Pr)4/TMSCl/MgのMcMurryカップリングへの適用”, 日本化学会第８９春季年会講演予稿集[3PC-136]（千葉，2009-3）. 何せいせい, 丹羽亮介, 大野千隼, 松野千加士, 岡本専太郎，“低原子価チタン反応剤Ti(O-i-Pr)4/TMSCl/Mgとエポキシドとの反応”, 日本化学会第８９春季年会講演予稿集[3PC-137]（千葉，2009-3）. 岡本専太郎, 大久保睦美, 何せいせい, 大野千隼, “有用低原子価チタン反応剤Ti(O-i-Pr)4/TMSCl/Mg: 不飽和化合物やエポキシドとの反応”, 第１６回欧州有機化学シンポジウム, （プラハ（チェコ）, 2009-7）. 何せいせい, 大野千隼, 正路規朗, 松野千加士, 岡本専太郎，“低原子価チタン反応剤Ti(O-i-Pr)4/TMSCl/Mgの開発とその反応”, 日本化学会第３回関東支部大会講演予稿集[P1-032]（千葉，2009-9）. 境勇造, 白鳥めぐみ, 佐藤留美, 松野千加士, 岡本専太郎，“アシル化触媒縮環ベンゾチアゾールアミン誘導体の合成と触媒活性”, 日本化学会第３回関東支部大会講演予稿集[P1-042]（千葉，2009-9）. 何せいせい, 大野千隼, 松野千加士, 岡本専太郎, “低原子価チタンアルコキシドの発生法とその反応性”, 第５６回有機金属化学討論会講演予稿集[P3C31]（大阪, 2009-9）. 杉山雄樹, 竹越千恵, 才野直子, 岡本専太郎, “コバルト触媒[2+2+2]環化付加反応による高分子合成”, 第５６回有機金属化学討論会講演予稿集[P2B22]（大阪, 2009-9）. 76) Sentaro OKAMOTO, Avijit GOSWAMI, Naoko SAINO and Taichi ITO, “NICKEL-CATALYZED DIMERIZATION AND POLYMERIZATION OF 1,6-DIYNES.” 16th International Symposium on Homogeneous Catalysis, [P360] (Florence (Italy), 2008-7). 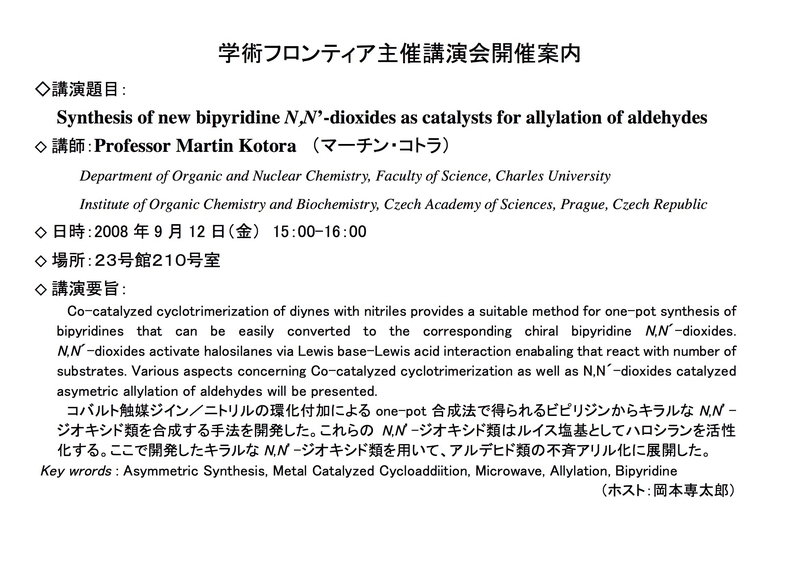 Taichi Ito, Avijit Goswami, Kazuhiko Ohtaki, Kouki Kase and Sentaro Okamoto,” Synthesis of Substituted 2,2’-Bipyridines by Cobalt-Catalyzed Cycloaddition Reactions of Nitriles and 1,6-Diynes with Exclusive Regioselectivity,” 54th Symposium on Organometallic Chemistry, Japan, [PB122] (Hiroshima, 2007-10). 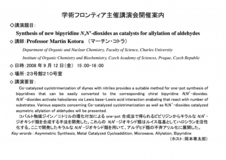 Akiko Tsuhako, Mariko Mihara, Toshio Aida, Norikatsu Kuboki, Kenji Kato, Chikashi Matsuno and Sentaro Okamoto, “Use of CaH2 as A Reductive Hydride Source for Reduction of Ketones, Aldehydes and Imines,” 54th Symposium on Organometallic Chemistry, Japan, [PB167] (Hiroshima, 2007-10). A. Goswami, K. Ohtaki, K. Kase, S. Okamoto, “Synthesis of Substituted 2,2'-Bipyridines by Cobalt-Catalyzed Cycloaddition Reactions of Nitriles and a,w-Diynes with Exclusive Regioselectivity”, 14th IUPAC International Symposium on Organometallic Chemistry Directed Towards Organic Synthesis, Proc. P-349 (Nara, Japan) (2007-8). S. Okamoto, K. Kase, A. Goswami, K. Ohtaki, E. Tanabe, N. Saino, “On-Demand Generation of a Catalyst for Pyridine Formation from Unactivated Nitriles and a,w-Diynes Using CoCl2-6H2O, dppe and Zn”, 14th IUPAC International Symposium on Organometallic Chemistry Directed Towards Organic Synthesis, Proc. P-348 (Nara, Japan) (2007-8). 才野直子, 雨宮史尋, 田邊絵美, 松野千加士, 岡本専太郎, 「Fe,Co,Ni塩を用いる系中触媒発生法によるアルキン環化三量化反応系の探索」, 日本化学会第８６春季年会講演予稿集[1H2-46]（千葉，2006-3）. 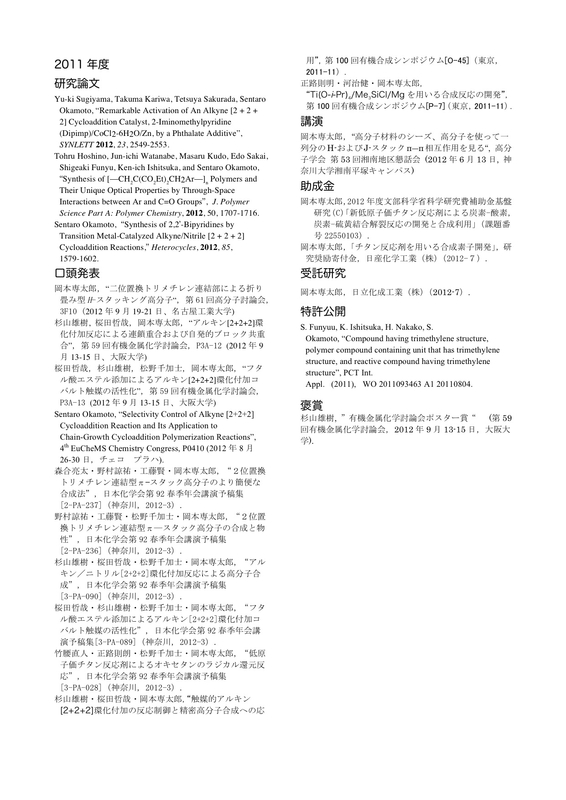 才野直子, 加瀬幸喜, 雨宮史尋, 岡本専太郎, 「2-イミノメチルピリジン/CoCl2-6H2/Zn触媒によるアルキン環化三量化反応」, 日本化学会第８６春季年会講演予稿集[1H2-47]（千葉，2006-3）. 大久保睦美, 松下瞳, 岡本専太郎, 「分子内アリルチタン化反応を用いるステロイドC,D環部の立体選択的構築」, 日本化学会第８６春季年会講演予稿集[1J1-29]（千葉，2006-3）. 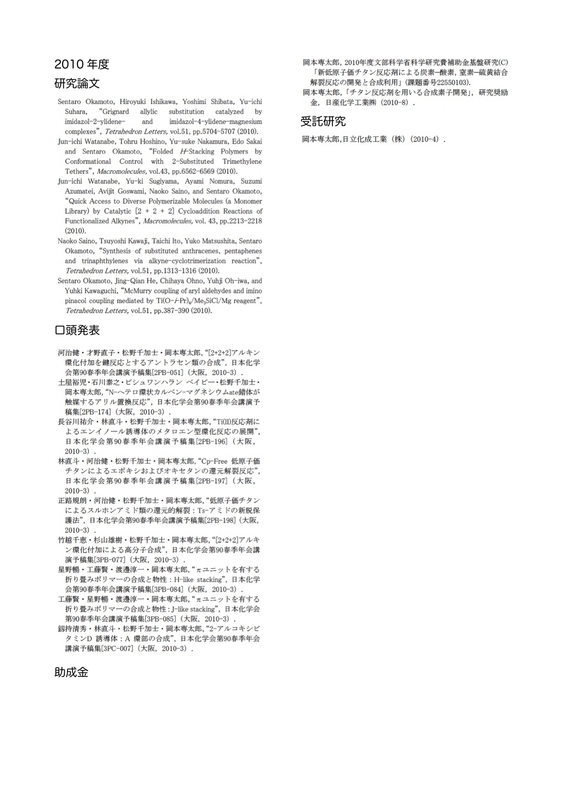 岡本専太郎，Avijit Goswami，才野直子，加瀬幸喜，「2-イミノメチルピリヂンあるいはジフォスフィン/MXn-mH2O/Zn (M = Fe, Co, Ni)を触媒とするアルキンの環化異性化反応」，第５３回有機金属化学討論会[PB227]（大阪，2006-9）. S. Okamoto, N. Saino, K. Kase, F. Mamemiya and E. Tanabe, “IRON- and COBALT-BASED HIGHLY PRACTICAL INSTANT CATALYST FOR CYCLOTRIMERIZATION OF ALKYNES TO SUBSTITUTED BENZENS”, 1st European Chemistry Congress, Proc. P.55 [C-PO-101] (Budapest, Hungary) (2006-8). 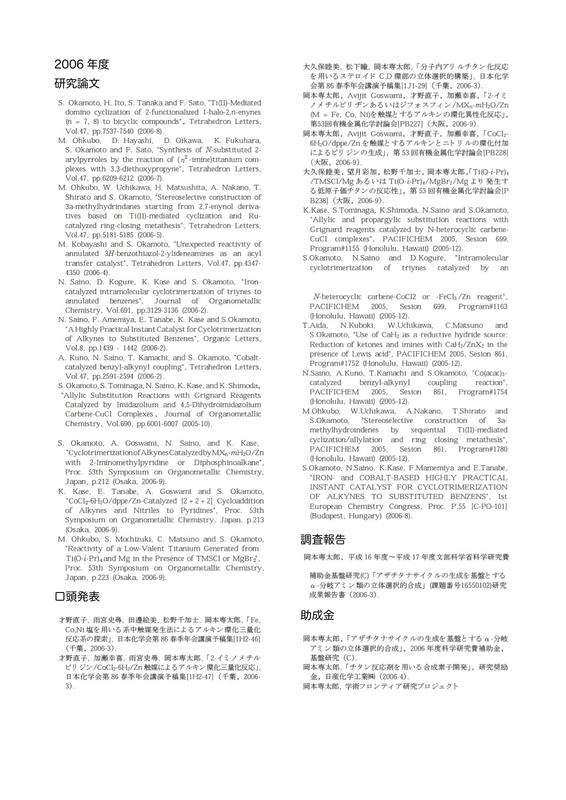 K. Kase, S. Tominaga, K. Shimoda, N. Saino and S. Okamoto, “Allylic and propargylic substitution reactions with Grignard reagents catalyzed by N-heterocyclic carbene-CuCl complexes”, PACIFICHEM 2005, Sesion 699, Program#1155 (Honolulu, Hawaii) (2005-12). S. Okamoto, N. Saino and D. Kogure, “Intramolecular cyclotrimerization of triynes catalyzed by an N-heterocyclic carbene-CoCl2 or –FeCl3/Zn reagent”, PACIFICHEM 2005, Sesion 699, Program#1163 (Honolulu, Hawaii) (2005-12). 90) T. Aida, N. Kuboki, W. Uchikawa, C. Matsuno and S. Okamoto, “Use of CaH2 as a reductive hydride source: Reduction of ketones and imines with CaH2/ZnX2 in the presence of Lewis acid”, PACIFICHEM 2005, Sesion 861, Program#1752 (Honolulu, Hawaii) (2005-12). N. Saino, A. Kuno, T. Kamachi and S. Okamoto, “Co(acac)3-catalyzed benzyl-alkynyl coupling reaction”, PACIFICHEM 2005, Sesion 861, Program#1754 (Honolulu, Hawaii) (2005-12). M. Ohkubo, W. Uchikawa, A. Nakano, T. Shirato and S. Okamoto, “Stereoselective construction of 3a-methylhydroindenes by sequential Ti(II)-mediated cyclization/allylation and ring closing metathesis”, PACIFICHEM 2005, Sesion 861, Program#1780 (Honolulu, Hawaii) (2005-12). [講演] 岡本専太郎，“高分子材料のシーズ、高分子を使って一列分のH-およびJ-スタックπ―π相互作用を見る“, 高分子学会 第53回湘南地区懇話会 (2012年6月13日, 神奈川大学湘南平塚キャンパス). Kouta Ibe, Haruko Aoki, Hiromasa Takagi, Kiyohide Ken-mochi, Yu-suke Hasegawa, Naoto Hayashi, and Sentaro Okamoto, "Preparation of 2-hydroxy A-ring precursors for synthesis of vitamin D3 analogues from lyxose”,Tetrahedron Letters, 2015, 56, 2015, 56, 2315-2318[Link]..
Tsuyoshi Kawaji, Noriaki Shoji, Kenji Miyashita, Sentaro Okamoto, "Non-Cp Titanium Alkoxide-Based Homolytic Ring-Opening of Epoxides by An Intramolecular Hydrogen Abstraction in beta-Titanoxy Radical Intermediates", Chemical Communications, 2011, 47, 7857-7859. Noriaki Shohji, Tsuyoshi Kawaji, Sentaro Okamoto, "Ti(O-i-Pr)4/Me3SiCl/Mg-Mediated Reductive Cleavage of Sulfonamides and Sulfonates To Amines and Alcohols", Organic Letters, 2011, 13, 2626-2629. Sentaro Okamoto, Jing-Qian He, Chihaya Ohno, Yuhji Oh-iwa, and Yuhki Kawaguchi, "McMurry coupling of aryl aldehydes and imino pinacol coupling mediated by Ti(O-i-Pr)4/Me3SiCl/Mg reagent", Tetrahedron Letters, 2010, 51, 387-390. Mutsumi Ohkubo, Sayaka Mochizuki, Takeshi Sano, Yuuki Kawaguchi, Sentaro Okamoto, "Selective Cleavage of Allyl and "Propargyl Ethers to Alcohols Catalyzed by Ti(O-i-Pr)4/MXn/Mg", Oragnic Letters, 2007, 9, 773-776. Sentaro Okamoto, Tom Livinghouse, "Titanium-Catalyzed Cycloisomerizatrion of 1,6-Dienes. Regio- and Stereoselective Synthesis of exo-Methylenecycloalkanes", Organometallics, 2000, 8, 1449-1451. Sentaro Okamoto, Tom Livinghouse, "Titanium(IV) Aryloxide Catalyzed Cyclization Reactions of 1,6- and 1,7-Dienes", J. Am. Chem. Soc., 2000, 122, 1223-1224. Tetsuya Sakurada, Yu-ki Sugiyama, Sentaro Okamoto “Cobalt-Catalyzed Cross Addition of Silylacetylenes to Internal Alkynes,” J. Org. Chem. 2013, 78, 3583-3591. Yu-ki Sugiyama, Takuma Kariwa, Tetsuya Sakurada, Sentaro Okamoto, “Remarkable Activation of An Alkyne [2 + 2 + 2] Cycloaddition Catalyst, 2-Iminomethylpyridine (Dipimp)/CoCl2-6H2O/Zn, by a Phthalate Additive” SYNLETT2012, 23, 2549-2553. Yu-ki Sugiyama, Rei Kato, Tetsuya Sakurada and Sentaro Okamoto, "Chain-Growth Cycloaddition Polymerization via a Catalytic Alkyne [2 + 2 + 2] Cyclotrimerization Reaction and Its Application to One-shot Spontaneous Block Copolymerization", J. Am. Chem. Soc. 2011, 133, 9712-9715. Yu-ki Sugiyama, Sentaro Okamoto, "Regioselective Synthesis of Substituted Pyridines and 2,2'-Dipyridines by a Cobalt-Catalyzed [2 + 2 + 2] Cycloaddition of alfa,omega-diynes with Nitriles", Synthesis2011, 2247-2254. Jun-ichi Watanabe, Yu-ki Sugiyama, Ayami Nomura, Suzumi Azumatei, Avijit Goswami, Naoko Saino, Sentaro Okamoto, "Quick Access to Diverse Polymerizable Molecules (a Monomer Library) by Catalytic [2 + 2 + 2] Cycloaddition Reactions of Functionalized Alkynes", Macromolecules, 2010, 43, 2213-2218. 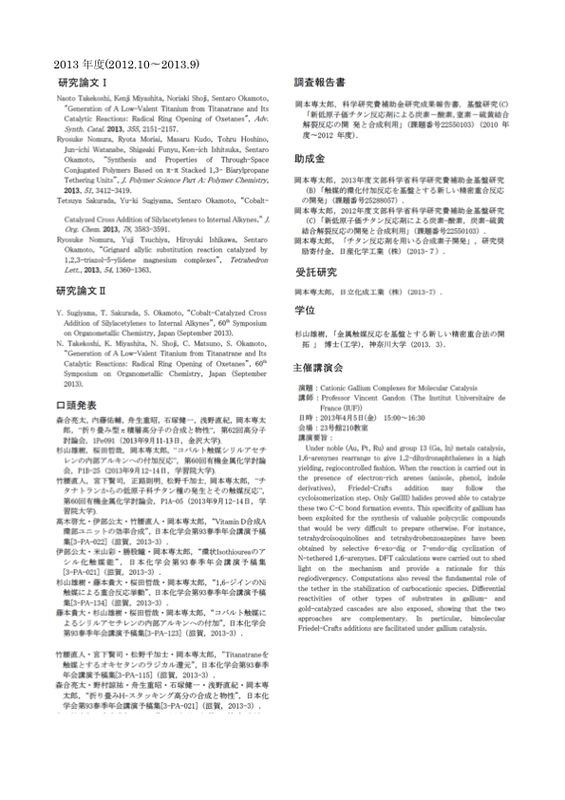 Naoko Saino, Tsuyoshi Kawaji, Taichi Ito, Yuko Matsushita and Sentaro Okamoto, "Synthesis of substituted anthracenes, pentaphenes and trinaphthylenes via alkyne cyclotrimerization reaction", Tetrahedron Letters, 2010, 51, 1313-1316. Avijit Goswami, Kazuhiko Ohtaki, Kouki Kase, Taichi Ito,　Sentaro Okamoto, “Synthesis of Substituted 2,2'-Bipyridines and 2,2':6,2"-Terpyridines by Cobalt-Catalyzed Cycloaddition Reactions of Nitriles and alfa,omega-Diynes with Exclusive Regioselectivity" Advanced Synthesis & Catalysis, 2008, 350, 143-152. Avijit Goswami, Taichi Ito and Sentaro Okamoto, "Efficient Activation of 2-Iminomethylpyridine/Cobalt-Baesd Alkyne [2 + 2 + 2] Cycloaddition Catalyst by Addition of a Silver Salt" , Advanced Synthesis & Catalysis, 2007, 349, 2368-2374. Kouki Kase, Avijit Goswami, Kazuhiko Ohtaki, Emi Tanabe, Naoko Saino, Sentaro Okamoto, "On-Demand Generation of an Efficient Catalyst for Pyridine Formation from Unactivated Nitriles and alfa,omega-Diynes Using CoCl2-6H2O, dppe and Zn", Organic Letters, 2007, 9, 931-934. Naoko Saino, Fumihiro Amemiya, Emi Tanabe, Kouki Kase and Sentaro Okamoto, "A Highly Practical Instant Catalyst for Cyclotrimerization of Alkynes to Substituted Benzenes", Organic Letters, 2006, 8, 1439-1442. 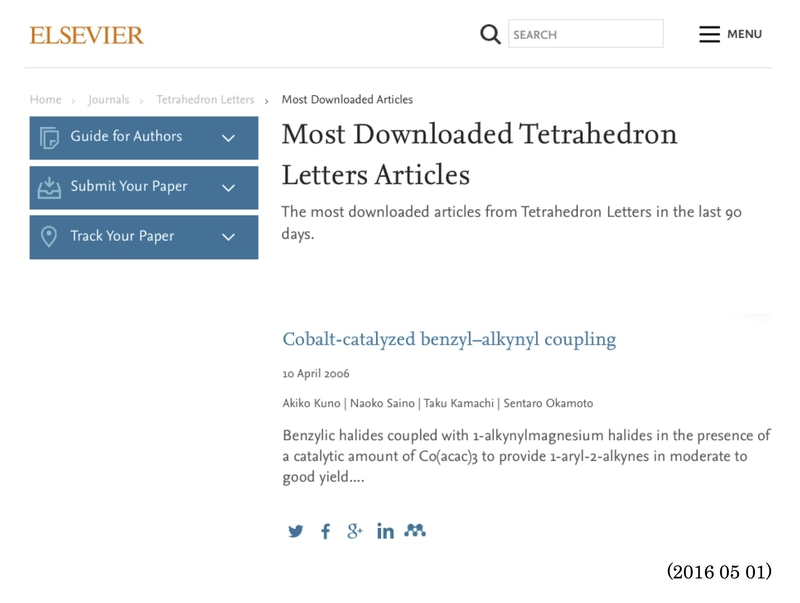 Akiko Kuno, Naoko Saino, Taku Kamachi, and Sentaro Okamoto, "Cobalt-catalyzed benzyl-alkynyl coupling", Tetrahedron Letters, 2006, 47, 2591-2594. Naoko Saino, Daisuke Kogure and Sentaro Okamoto, "Intramolecular Cyclotrimerization of Triynes Catalyzed by N-Heterocyclic Carbene-CoCl2/Zn or -FeCl3/Zn", Organic Letters, 2005, 7, 3065-3067. Taku Kamachi, Akiko Kuno, Chikashi Matsuno and Sentaro Okamoto, "Cobalt-catalyzed mono-coupling of R3SiCH2MgCl with 1,2-dihalogenoethylene: A general route to gamma-substituted (E)-allylsilanes", Tetrahedron Letters, 2004, 45, 4677-4679. Yu-ki Sugiyama, Shiori Heigozono, and Sentaro Okamoto, "Iron-Catalyzed Reductive Magnesiation of Oxetanes to Gen-erate (3-Oxidopropyl)magnesium Reagents”,Organic Letters, 2014, 16, 6278-6281. Naoko Saino, Daisuke Kogure, Kouki Kase and Sentaro Okamoto, "Iron-catalyzed intramolecular cyclotrimerization of triynes to annulated benzenes", J. Organometallic Chemistry, 2006, 691, 3129-3136. Avijit Goswami, Taichi Ito, Naoko Saino, Kouki Kase, Chikashi Matsuno and Sentaro Okamoto, "Selective Dimerization of 1,6 Diynes Catalyzed by Ionic Liquid-Supported Nickel Complexes in An Ionic Liquid/Toluene Biphasic System", Chem. Commun. 2009, 439-441. Akiko Tsuhako, Daisuke Oikawa, Kazushi Sakai, Sentao Okamoto, "Copper-catalyzed intramolecular hydroamination of allenylamines to 3-pyrrolines or 2-alkenylpyrrolidines" Tetrahedron Letters, 2008, 49, 6529-6532. Sentaro Okamoto, Satoshi Tominaga, Naoko Saino, Kouki Kase and Kentaro Shimoda, "Allylic Substitution Reactions with Grignard Reagents Catalyzed by Imidazolium and 4,5-Dihydroimidazolium Carbene-CuCl Complexes", J. Organometallic Chemistry, 2005, 690, 6001-6007 and see also Erratum. 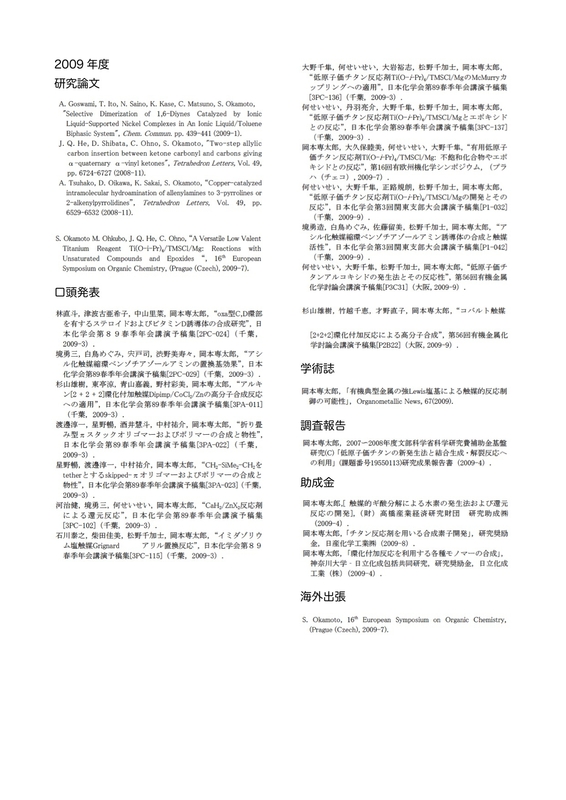 Satoshi Tominaga, Yukinao Oi, Toshio Kato, Duk Keun An and Sentaro Okamoto, "gamma-Selective allylic substitution reaction with Grignard reagents catalyzed by copper N-heterocyclic carbene complexes and its application to enantioselective synthesis", Tetrahedron Letters, 2004, 45, 5585-5588. Takeshi Hanazawa, Akiko Koyama, Takeshi Wada, Eiko Morishige, Sentaro Okamoto, Fumie Sato, "Efficient Convergent Synthesis of 1alfa,25-Dihydroxyvitamin D3 and Its Analogues by Suzuki-Miyaura Coupling", Organic Letters, 2003, 5, 523-525 and see also Organic Letters, 2003, 5, 3167 (addition and corrections). Yu-ki Sugiyama, Shiori Heigozono, and Sentaro Okamoto, "Iron-Catalyzed Reductive Magnesiation of Oxetanes to Gen-erate (3-Oxidopropyl)magnesium Reagents”, Organic Letters, 2014, accepted. 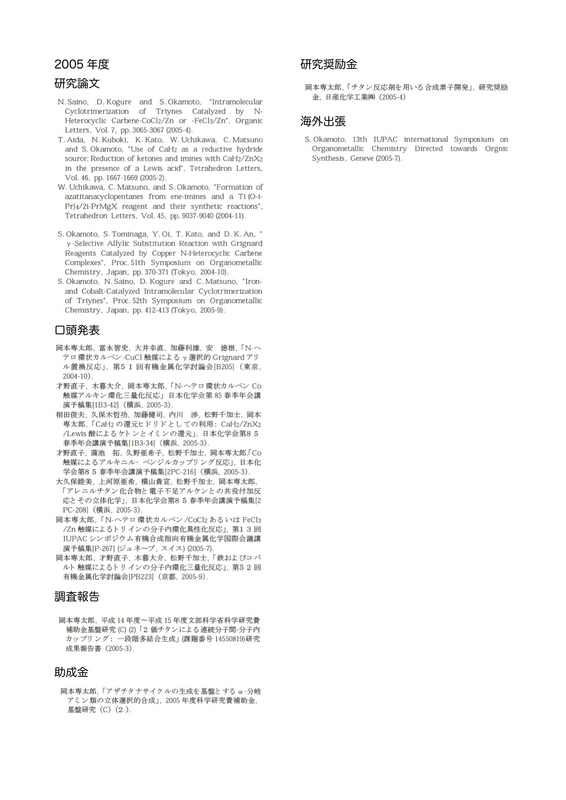 Sentaro Okamoto, Hiroyuki Ishikawa, Yoshimi Shibata, Yu-ichiro Suhara, "Grignard allylic substitution catalyzed by imidazol-2-ylidene- and imidazol-4-ylidene-magnesium complexes", Tetrahedron Letters, 2010, 51, 5704-5707. 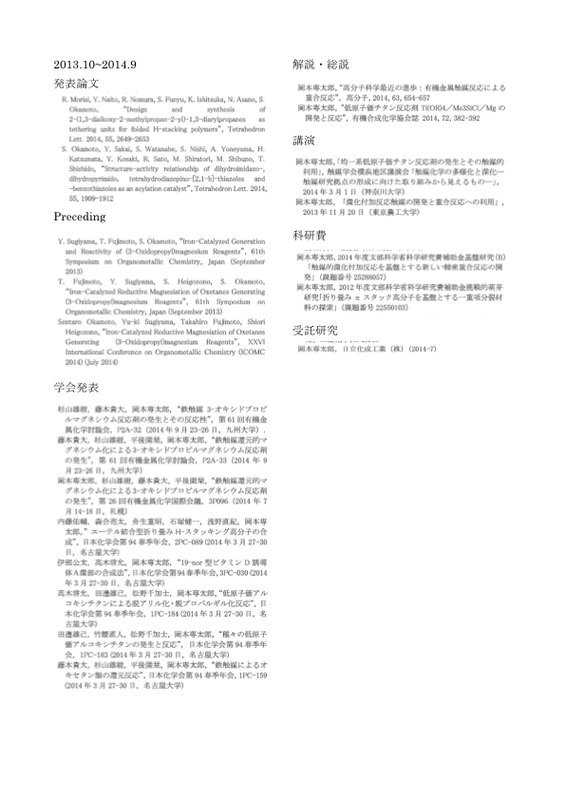 Akiko Tsuhako, Jing-Qian He, Mariko Mihara, Naoko Saino and Sentaro Okamoto, "Carbonyl reduction with CaH2 and R3SiCl catalyzed by ZnCl2" Tetrahedron Letters, 2007, 47, 9120-9123. Toshio Aida, Norikatsu Kuboki, Kenji Kato, Wataru Uchikawa, Chikashi Matsuno and Sentaro Okamoto, "Use of CaH2 as a reductive hydride source: Reduction of ketones and imines with CaH2/ZnX2 in the presence of a Lewis acid", Tetrahedron Letters, 2005, 46, 1667-1669. Ryota Moriai, Yu-suke Naito, Ryosuke Nomura, Shigeaki Funyu, Ken-ich Ishitsuka, Naoki Asano and Sentaro Okamoto, "Design and synthesis of 2-(1,3-dialkoxy-2-methylpropan-2-yl)-1,3-diarylpropanes as tethering units for folded H-stacking polymers", Tetrahedron Lett., 2014, 55, 2649-2653. Ryosuke Nomura, Ryota Moriai, Masaru Kudo, Tohru Hoshino, Jun-ichi Watanabe, Shigeaki Funyu, Ken-ich Ishitsuka, and Sentaro Okamoto “Synthesis and Properties of Through-Space Conjugated Polymers Based on pi–pi Stacked 1,3-Biarylpropane Tethering Units” J. Polymer Science Part A: Polymer Chemistry, 2013, 51, 3412-3419. Tohru Hoshino, Jun-ichi Watanabe, Masaru Kudo, Edo Sakai, Shigeaki Funyu, Ken-ich Ishitsuka, and Sentaro Okamoto, “Synthesis of [—CH2C(CO2Et)2CH2Ar—]n Polymers and Their Unique Optical Properties by Through-Space Interactions between Ar and C=O Groups”, J. Polymer Science Part A: Polymer Chemistry, 2012, 50, 1707-1716. Jun-ichi Watanabe, Tohru Hoshino, Yu-suke Nakamura, Edo Sakai and Sentaro Okamoto, "Folded H-Stacking Polymers by "Conformational Control with 2-Substituted Trimethylene Tethers", Macromolecules, 2010, 43, 6562-6569. Avijit Goswami, Taichi Ito, Naoko Saino, Kouki Kase, Chikashi Matsuno and Sentaro Okamoto, "Selective Dimerization of 1,6-Diynes Catalyzed by Ionic Liquid-Supported Nickel Complexes in An Ionic Liquid/Toluene Biphasic System", Chem. Commun. 2009, 439-441. Jing-Qian He, Daisuke Shibata, Chihaya Ohno, Sentaro Okamoto, "Two-step allylic carbon insertion between ketone carbonyl and carbons giving a-quaternary a-vinyl ketones", Tetrahedron Letters, 2008, 49, 6724-6727. Yongcheng Song, Sentaro Okamoto, Fumie Sato, "An efficient synthesis of optically active (2R,3R)-2-methyl-3-[(1R)-1-methylprop-2-enyl]cyclopentanone, a useful chiral building block for synthesis of vitamin D and steroids", Tetrahedron Letters, 2003, 44, 2113-2115. 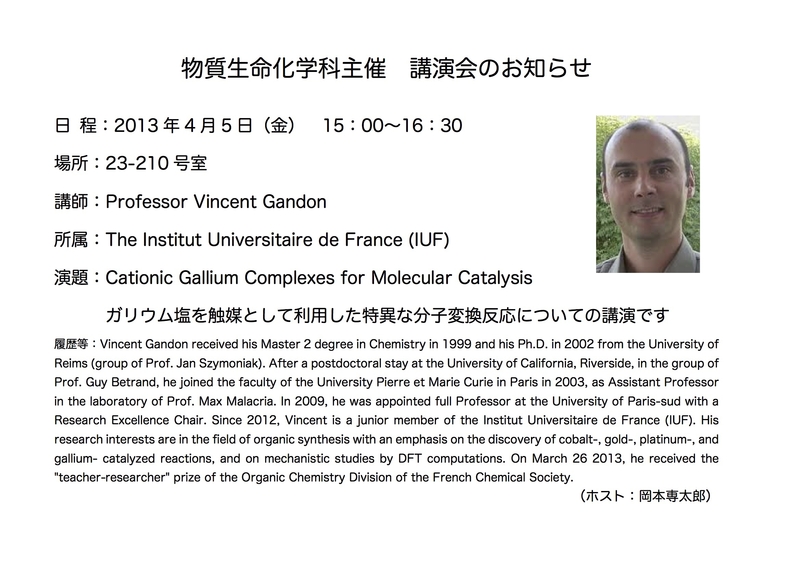 Christophe Delas, Sentaro Okamoto and Fumie Sato, "Highly selective addition reaction of organotitaniums with Garner's aldehyde. Easy preparation of optically active allylic, allenylic, homoallylic and homopropargylic alcohols. ", Tetrahedron Lett., 2002, 43, 4373-4375. Yongcheng Song, Sentaro Okamoto, and Fumie Sato, "Highly Stereoselective Asymmetric Construction of an Acyclic Carbon Skeleton Having Two Adjacent Alkyl Substituents by Michael Addition of OpticallyActiveAllenyltitaniums to Alkylidenemalonates", Organic Letters, 2001, 3, 3543-3545. Xin Teng, Takeshi Wada, Sentaro Okamoto, Fumie Sato, 2One-pot preparation of 2-substituted and 2,3-disubstituted furans from 2-alkynaltetramethylethylene acetals and aldehydes using a divalent titanium reagent Ti(O-i-Pr)4/2 i-PrMgX", Tetrahedron Lett.2001, 42, 5501-5503. Sentaro Okamoto, Kohki Fukuhara, Fumie Sato, "An Efficient and Practical Preparation of OpticallyActivesyn-1-Vinyl-2-amino Alcohol Derivatives by the Regio- and Diastereoselective Addition Reaction of (alfa-Alkoxyallyl) titaniums with Chiral Imines. Formal Synthesis of Statine", Tetrahedron Letters, 2000, 41, 5561-5565. Takeshi Hanazawa, Sentaro Okamoto, Fumie Sato, "Preparation of Titanated Alkoxyallenes from 3-Alkoxy-2-propyn-1-yl Carbonates and ( eta2-Propene)Ti(O-i-Pr)2 as an Efficient Ester Homoaldol Equivalent", Organic Letters, 2000, 2, 2369-2371. Xin Teng, Yuuki Takayama, Sentaro Okamoto, and Fumie Sato, "Development of a Chiral Propionaldehyde Homoenolate Equivalent Which Reacts with Imines with Excellent Stereoselectivity. Efficient and Practical Synthesis of OpticallyActive γ-Amino Carbonyl Compounds", J. Am. Chem. Soc., 1999, 121, 11916-11917. Duk Keun An, Koichiro Hirakawa, Sentaro Okamoto, Fumie Sato, "Electrophilic Amination of Racemic and Non-racemic Allenyltitaniums. One-pot Synthesis of α-Hydrazino-alkynes from Propargylic Alcohol Derivatives", Tetrahedron Letters, 1999, 40, 3737-3740. Sentaro Okamoto, Duk Keun An, Fumie Sato, "Synthesis of OpticallyActiveAllenyltitaniums Having Axial Chirality by the Reaction of OpticallyActivePropargylic Compounds with a Ti(O-i-Pr)4/2i-PrMgCl Reagent", Tetrahedron Letters, 1998, 39, 4551-4554. Duk Keun An, Sentaro Okamoto, Fumie Sato, "Synthesis of Chiral Alkynes Having 2H or Halogen at the Secondary or Tertiary Propargylic Stereogenic Center by Hydrolysis and Halogenolysis of OpticallyActiveAllenyltitaniums Having Axial Chirality", Tetrahedron Letters, 1998, 39, 4555-4558. Teng Xin, Sentaro Okamoto, Fumie Sato, "1,5-Asymmetric Induction in Addition Reaction of Aldehydes with Chiral Allyltitaniums Having an Amino Group at theStereogenicCenter. Synthesis of OpticallyActive2,6-cis-Disubstituted Piperidines", Tetrahedron Letters, 1998, 39, 6927-6930. Sentaro Okamoto, Hiroyoshi Sato, Fumie Sato, "Highly Efficient Synthesis of Alka-1,3-dien-2-yltitanium Compounds from Alka-2,3-dienyl Carbonates. A New, Practical Synthesis of 1,3-Dienes and 2-Iodo-1,3-dienes", Tetrahedron Letters,1996, 37, 8865-8868. 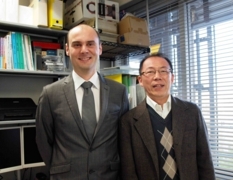 Aleksandr Kasatkin, Takashi Nakagawa, Sentaro Okamoto, Fumie Sato,　"New, Efficient Method for the Synthesis of Allyltitanium Compounds from Allyl Halides or Allyl Alcohol Derivatives via Oxidative Addition. A Highly Efficient and Practical Synthesis of Homoallyl Alcohols",　J. Am. Chem. Soc.,1995, 117, 3881-3882. Takeshi Hanazawa, Hajime Inamori, Tomoko Masuda, Sentaro Okamoto, Fumie Sato, "Efficient and Practical Synthesis of the A-Ring Precursor of 19-nor-1alfa,25-Dihydroxyvitamin D3 and its 13C- or 2H-Labeled Derivative", Organic Letters2001, 3, 2205-2207. Takeshi Hanazawa, Sentaro okamoto, Fumie Sato, "Chemical synthesis of optically active cis-cyclohexa-3,5-diene-1,2-diols and their 5-2H-derivatives", Tetrahedron Lett. 2001, 42, 5455-5457. Kwangho Kim, Sentaro Okamoto, Fumie Sato, "Regiocontrol of Radical Cyclization by Lewis Acids. Efficient Synthesis of OpticallyActive Functionalized Cyclopentanes and Cyclohexanes", Organic Letters2001, 3, 67-69. Masaaki Shirai, Sentaro Okamoto, Fumie Sato, "Practical Synthesis of OpticallyActiveBicyclic Oxazolidinylpiperidines, Chiral Building Blocks for Preparing 1-Deoxyazasugars, from Serine", Tetrahedron Letters, 1999, 40, 5331-5332. Sentaro Okamoto, Masayuki Iwakubo, Katsushige Kobayashi, Fumie Sato, "Efficient and Practical Method for Synthesizing N-Heterocyclic Compounds Using Intramolecular Nucleophilic Acyl Substitution Reactions Mediated by Ti(O-i-Pr)4/2 i-PrMgX Reagent. Synthesis of Quinolones, Pyrroles, Indoles, and OpticallyActive N-Heterocycles Including Allopumiliotoxin Alkaloid 267A", J. Am. Chem. Soc., 1997, 119, 6984-6990. Sentaro Okamoto, Aleksandr Kasatkin, P. K. Zubaidha, Fumie Sato, "Intramolecular Nucleophilic Acyl Substitution Reactions Mediated by XTi(O-i-Pr)3 (X=Cl, O-i-Pr) / 2 i-PrMgBr Reagent. Efficient Synthesis of Functionalized Organotitanium Compounds from Unsaturated Compounds", J. Am. Chem. Soc., 1996, 118, 2208-2216. Aleksandr Kasatkin, Katsushige Kobayashi, Sentaro Okamoto, Fumie Sato, "Synthesis of 1-Hydroxybicyclo[n.1.0]alkanes (n = 3 and 4) and Their Silyl Ethers from Olefinic Esters via Tandem Intramolecular Nucleophilic Acyl Substitution and Intramolecular Carbonyl Addition Reactions Mediated by Ti(OPr-i)4 / 2 i-PrMgCl Reagent", Tetrahedron Letters, 1996, 37, 1849-1852. Yukio Yoshida, Sentaro Okamoto, Fumie Sato, "Intramolecular Nucleophilic Acyl Substitution Reaction of 3,4-Alkadienyl Carbonates Mediated by Ti(O-i-Pr)4 / 2 i-PrMgCl Reagent. Efficient Synthesis of OpticallyActiveβ,γ-Unsaturated Esters with an alfa-Substituent", J. Org. Chem.,1996, 61, 7826-7831. Aleksandr Kasatkin, Sentaro Okamoto, Fumie Sato,　"Intramolecular Nucleophilic Acyl Substitution Reactions Mediated by Ti(OPr-i)4/2 i-PrMgBr Reagent. Synthesis of Vinyltitanium Compounds Having a Lactone and/or an Ester Group from Acetylenic Carbonates", Tetrahedron Letters, 1995, 36, 6075-6078. Kouta Ibe, Haruko Aoki, Hiromasa Takagi, Kiyohide Ken-mochi, Yu-suke Hasegawa, Naoto Hayashi, and Sentaro Okamoto, "Preparation of 2-hydroxy A-ring precursors for synthesis of vitamin D3 analogues from lyxose”,Tetrahedron Letters, 2015, 56, 2015, 56, 2315-2318 [Link]..
Sentaro Okamoto, Hidemoto Ito, Shogo Tanakab and Fumie Sato, "Ti(II)-Mediated domino cyclization of 2-functionalized 1-halo-2,n-enynes (n = 7, 8) to bicyclic compounds", Tetrahedron Letters, 2006, 47, 7537-7540. Wataru Uchikawa, Chikashi Matsuno, and Sentaro Okamoto, "Formation of azatitanacyclopentanes from ene-imines and a Ti(O-i-Pr)4/2 i-PrMgX reagent and their synthetic reactions", Tetrahedron Letters, 2004, 45, 9037-9040. Yongcheng Song, Yuuki Takayama, Sentaro Okamoto, Fumie Sato, "An efficient synthesis of optically active five- and six-membered cyclic compounds with selectable stereo-controls by a Ti(II)-mediated cyclization of chiral secondary 2,7- and 2,8-enyn-1-ol derivatives", Tetrahedron Letters, 2003, 44, 653-657. Yongcheng Song, Sentaro Okamoto, Fumie Sato, "Synthesis of carbo- and aza-bicyclo[4.3.0] and [4.4.0] compounds by Ti(II)-mediated cyclization of 2,7- or 2,8-enynyl-1-ol derivatives", Tetrahedron Letters, 2002, 43, 6511-6514. Subburaj Kandasamy, Sentaro Okamoto, Fumie Sato, "Development of New Chiral Building Blocks for Synthesis of Bicyclo[3.3.0]octane Compounds", J. Org. Chem. 2002, 67, 1024-1026. Mutsumi Ohkubo, Wataru Uchikawa, Hitomi Matsushita, Aiko Nakano, Takayuki Shirato and Sentaro Okamoto, “Stereoselective construction of 3a-methylhydrindanes starting from 2,7-enynol derivatives based on Ti(II)-mediated cyclization and Ru-catalyzed ring-closing metathesis”, Tetrahedron Letters, 2006, 47, 5181-5185. Sentaro Okamoto, Kandasamy Subburaj, Fumie Sato, "Ti(II)-Mediated Tandem Inter- and Intramolecular Coupling Reaction of Unsaturated Hydrocarbons: One-pot Preparation of Cyclopentanes and Cyclohexanes from Readily Available Acyclic Starting Materials", J. Am. Chem. Soc.2001, 123, 4857-4858. Sentaro Okamoto, Xin Teng, Shintaro Fujii, Yuuki Takayama, Fumie Sato, "An Allyltitanium Derived from Acrolein 1,2-Dicyclohexylethylene Acetal and ( eta2-propene)Ti(O-i-Pr)2 as a Chiral Propionaldehyde Homoenolate Equivalent Which Reacts with Imines with Excellent Stereoselectivity. An Efficient and Practical Access to Optically Active-Amino Carbonyl Compounds", J. Am. Chem. Soc. 2001, 123, 3462-3471. Sentaro Okamoto, Tuuki Takayama, Yuan Gao, Fumie Sato, "One-pot Synthesis of a Variety of 1,4-Alkadienes and 1,2,4-Alkatrienes from Alkynes, Allyl, or Propargyl Compounds and Electrophiles by a ( eta2-propene)Ti(O-i-Pr)2 Mediated Reaction", Synthesis2000, 975-979. Yuuki Takayama, Sentaro Okamoto, Fumie Sato, "Stereoselective Synthesis of OpticallyActiveSubstituted Piperidines and Pyrrolidines from Amino Acid Derivatives by Titanium(II)-Mediated Intramolecular Cyclization Reaction", Tetrahedron Letters, 1997, 38, 8351-8354. Mutsumi Ohkubo, Daisuke Hayashi, Daisuke Oikawa, Kouki Fukuhara, Sentaro Okamoto, Fumie Sato, "Synthesis of N-substituted 2-arylpyrroles by the reaction of (eta2-imine)titanium complexes with 3,3-diethoxypropyne", Tetrahedron Letters, 2006, 47, 6209-6212. Kohki Fukuhara, Sentaro Okamoto, Fumie Sato, "Asymmetric Synthesis of Allyl- and alfa-Allenylamines from Chiral Imines and Alkynes via ( eta2-Imine)Ti(O-i-Pr)2 Complexes", Organic Letters, 2003, 5, 2145-2149 . Baby Viswambharan, Tatsuya Okimura, Satoko Suzuki, Sentaro Okamoto, "Synthesis and Catalytic Properties of 4-Aryl-2,3-dihydro-4H-pyrimido[2,3-b]benzothiazoles for Asymmetric Acyl or Carboxyl Group Transfer Reactions", J. Org. Chem. 2011, 76, 6678-6685. Sentaro Okamoto, Kouici Takano, Tomohiro Ishikawa, Satoshi Ishigami and Akiko Tsuhako, "Activity and behavior of imidazolium salts as a phase transfer catalyst for a liquid-liquid phase system", Tetrahedron Letters, 2006, 47, 8055-8058. Megumi Kobayashi and Sentaro Okamoto, “Unexpected reactivity of annulated 3H-benzothiazol-2-ylideneamines as an acyl transfer catalyst”, Tetrahedron Letters, 2006, 47, 4347-4350. Akiko Tsuhako, Daisuke Oikawa, Kazushi Sakai, Sentao Okamoto, "Copper-catalyzed intramolecular hydroamination of allenylamines to 3-pyrrolines or 2-alkenylpyrrolidines", Tetrahedron Letters, 2008, 49, 6529-6532. Sentaro Okamoto, Hiromi Tsujiyama, Toshiharu Yoshino, Fumie Sato, "Synthesis of Optically Activegamma-Trimethylsilyl-beta, gamma-Epoxy Tertiary Alcohols by the Diastereoselective Addition Reaction of beta-Trimethylsilyl-alfa, beta-Epoxyketones with Grignard Reagents", Tetrahedron Letters, 1991, 32, 5789-5792. Sentaro Okamoto, Yuichi Kobayashi, Hiroshi Kato, Kimihiko Hori, Takashi Takahashi, Jiro　Tsuji, Fumie Sato, "Prostaglandin Synthesis via Two-Component Coupling. Highly Efficient Synthesis of Chiral　Prostaglandin Intermediates 4-Alkoxy-2-Alkyl-2-Cyclopenten-1-one and 4-Alkoxy-3-Alkenyl-2-Methylenecyclopentan-1-one", J. Org. Chem., 1988, 53, 5590-5592. 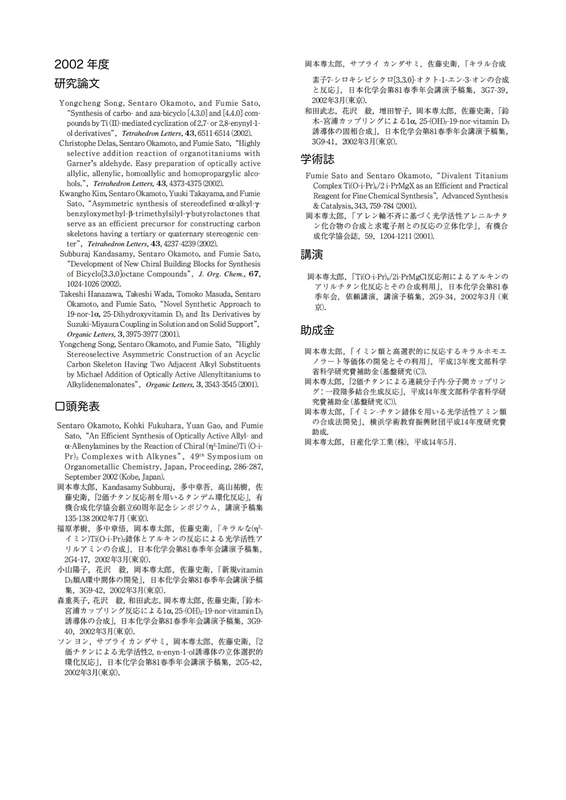 Sentaro Okamoto, Kousuke Tani, Fumie Sato, K. Barry Sharpless, Davit Zargarian, "Synthesis of OpticallyActiveSecondary Allylic Alcohols from Allylsilanes via Successive Asymmetric Dihydroxylation (AD) and Peterson Olefination Reactions", Tetrahedron Letters, 1993, 34, 2509-2512. Kousuke Tani, Yoshitaka Sato, Sentaro Okamoto, Fumie Sato, "Synthesis of OpticallyActiveFurfuryl Alcohols and Butenolides from trans-1-Trimethylsilyl-3-Alken-1-ynes via Successive Asymmetric Dihydroxylation and Hydromagnesiation Reactions", Tetrahedron Letters, 1993, 34, 4975-4978. Yasunori Kitano, Takashi Matsumoto, Takenori Wakasa, Sentaro Okamoto, Toshiyuki Shimazaki, Yuichi Kobayashi, Fumie Sato, Katsuaki Miyaji, Kazutaka Arai, "A Highly Efficient Synthesis of Optically Pure gamma-iodo Allylic Alcohols and their Conversion into Various OpticallyActiveAllylic Alcohols", Tetrahedron Letters, 1987, 28, 6351-6354. Yasunori Kitano, Takashi Matsumoto, Sentaro Okamoto, Toshiyuki Shimazaki, Yuichi　Kobayashi, Fumie Sato, "A Highly Efficient Synthesis of Prostaglandin omega-Chain Precursors", Chemistry Letters, 1987, 1523-1526. Naoto Takekoshi, Kenji Miyashita, Noriaki Shoji, and Sentaro Okamoto, "Generation of A Low-Valent Titanium from Titanatrane and Its Catalytic Reactions: Radical Ring Opening of Oxetanes", Adv. Synth. Catal. 2013, 355, 2151-2157. Tsuyoshi Kawaji, Noriaki Shoji, Kenji Miyashita, Sentaro Okamoto, "Non-Cp Titanium Alkoxide-Based Homolytic Ring-Opening of Epoxides by An Intramolecular Hydrogen Abstraction in β-Titanoxy Radical Intermediates", Chemical Communications, 2011, 47, 7857-7859. Kouta Ibe, Haruko Aoki, Hiromasa Takagi, Kiyohide Ken-mochi, Yu-suke Hasegawa, Naoto Hayashi, and Sentaro Okamoto, "Preparation of 2-hydroxy A-ring precursors for synthesis of vitamin D3 analogues from lyxose”,Tetrahedron Letters, 2015, 56, 2315-2318. Kouta Ibe, Yu-suke Hasegawa, Misuzu Shibuno, Tsukasa Shishido, Yuzo Sakai, Yu Kosaki, Keisuke Susa, and Sentaro Okamoto, "Simple and practical method for selective acylation of primary hydroxy group catalyzed by N-methyl-2-phenylimidazole (Ph-NMI) or 2-phenylimidazo[2,1-b]benzothiazoles (Ph-IBT)”,Tetrahedron Lett., 2014, 55, 7039-7042. Mutsumi Ohkubo, Sayaka Mochizuki, Takeshi Sano, Yuuki Kawaguchi, Sentaro Okamoto, "Selective Cleavage of Allyl and Propargyl Ethers to Alcohols Catalyzed by Ti(O-i-Pr)4/MXn/Mg", Organic Letters, 2007, 9, 773-776. Naoya Ono, Mie Tsuboi, Sentaro Okamoto, Tohru Tanami, Fumie Sato, "Synthesis of Allyl Ester of Prostaglandin E and the Conversion of the Allyl Ester Moietyinto Carboxylic Acid by Chemical Method. A Highly Practical Synthesis of Natural PGE1 and Limaprost", Chemistry Letters, 1992, 2095-2098. Takayori Ito, Isao Yamakawa, Sentaro Okamoto, Yuichi Kobayashi, Fumie Sato, "A New Stereoselective Method for Synthesis of OpticallyActivebeta-Alkylhomoallyl　Alcohols and gamma, delta-Epoxy-beta-Alkyl Alcohols", Tetrahedron Letters, 1991, 32, 371-374. Takayori Ito, Sentaro Okamoto, Fumie Sato, "Synthesis of OpticallyActivealfa-Trimethylsilyl delta alfa,beta-Butenolides and their Conversion into Various Butenolides and Saturated gamma-Lactones", Tetrahedron Letters, 1990, 31, 6399-6402. Yasunori Kitano, Sentaro Okamoto, Fumie Sato, "A New Method for the Synthesis of Protected Chiral 4-Hydroxy-2-Cyclopentenone", Chemistry Letters, 1989, 2163-2164. Yasunori Kitano, Takashi Matsumoto, Takenori Wakasa, Sentaro Okamoto, Toshiyuki Shimazaki, Yuichi Kobayashi, Fumie Sato, Katsuaki Miyaji, Kazutaka Arai, "A Highly Efficient Synthesis of Optically Pure gamma-iodo Allylic Alcohols and their Conversion into Various OpticallyActiveAllylic Alcohols",Tetrahedron Letters, 1987, 28, 6351-6354. Yasunori Kitano, Takashi Matsumoto, Sentaro Okamoto, Toshiyuki Shimazaki, Yuichi Kobayashi, Fumie Sato, "A Highly Efficient Synthesis of Prostaglandin omega-Chain Precursors", Chemistry Letters, 1987, 1523-1526. Sentaro Okamoto, Toshiyuki Shimazaki, Yuichi Kobayashi, Fumie Sato, "A Highly Efficient Synthesis of gamma-Halo Allylic and Propargylic Alcohols with High Optical　Purity. Practical Method for Synthesis of the Prostaglandin omega-Chain", Tetrahedron Letters, 1987, 28, 2033-2036. Sentaro Okamoto, Toshiyuki Shimazaki, Yasunori Kitano, Yuichi Kobayashi, Fumie Sato, "A Practical Preparation of α-Hydroxy and alfa,beta-Dihydroxy Aldehydes, Useful　Intermediates for the Synthesis of Arachidonic Acid Metabolites, Starting with D-Glyceraldehyde Acetonide", J. Chem. Soc., Chem. Commun., 1986, 1352-1355. Akiko Tsuhako, Daisuke Oikawa, Kazushi Sakai, Sentao Okamoto, "Copper-catalyzed intramolecular hydroamination of allenylamines to 3-pyrrolines or 2-alkenylpyrrolidines", Tetrahedron Letters, 2007, 47, 9120-9123. Sentaro Okamoto, Kohki Fukuhara, Fumie Sato, "An Efficient and Practical Preparation of OpticallyActivesyn-1-Vinyl-2-amino Alcohol Derivatives by the Regio- and Diastereoselective Addition Reaction of ( alfa-Alkoxyallyl) titaniums with Chiral Imines. Formal Synthesis of Statine", 2Tetrahedron Letters 2000, 41, 5561-5565. Sentaro Okamoto, Masayuki Iwakubo, Katsushige Kobayaishi, Fumie Sato, "Efficient and Practical Method for Synthesizing N-Heterocyclic Compounds Using Intramolecular Nucleophilic Acyl Substitution Reactions Mediated by Ti(O-i-Pr)4/2 i-PrMgX Reagent. Synthesis of Quinolones, Pyrroles, Indoles, and OpticallyActiveN-Heterocycles Including Allopumiliotoxin Alkaloid 267A", J. Am. Chem. Soc., 1997, 119, 6984-6990. Sentaro Okamoto, Kandasamy Subburaj, Fumie Sato, "Highly Stereocontrolled Synthesis of Carbacyclin from Acyclic Starting Materials via Ti(II)-Mediated Tandem Cyclization", J. Am. Chem. Soc.,2000, 122, 11244-11245. Youichi Shimazaki, Kazuya Kameo, Tohru Tanami, Hideo Tanaka, Naoya Ono, Youichi Kiuchi, Sentaro Okamoto, Fumie Sato, Atsushi Ichikawa, "Synthesis and Structure-Activity Relationships of a New Class of Selective EP3 Receptor Agonist, 13,14-Didehydro-16-phenoxy Analogues of Prostaglandin E1", Bioorg. Med. Chem., 2000, 8, 353-362. Tohru Tanami, Kazuya Kameo, Naoya Ono, Takashi Nakagawa, Shigesato Annou, Mie Tsuboi, Kousuke Tani, Sentaro Okamoto, Fumie Sato, "Synthesis and Pharmacological Activities of 13-dehydro Derivatives of Primary Prostaglandins", Bioorganic & Medical Chem. Lett.,1998, 8, 1507-1510. Yasufumi Kawanaka, Naoya Ono, Yukio Yoshida, Sentaro Okamoto, Fumie Sato, "Synthesis of the Key Component for Preparation of 6-Keto-prostaglandins by a Two-Component Coupling Process: Synthesis of 6-Keto-Prostaglandin E1, Ornoprostill and delta2-trans-6-Keto-Prostaglandin E1.",J. Chem. Soc., Perkin Trans. 1,1996, 715-718. Yukio Yoshida, Yoshitaka Sato, Sentaro Okamoto, Fumie Sato, "An Efficient Approach to OpticallyActiveBenzoprostacyclins by a Two-Component Coupling Process", J. Chem. Soc., Chem. Commun., 1995, 811-812. E. H. Oliw, Sentaro Okamoto, L. Hornsten, Fumie Sato, "Biosynthesis of Prostaglandins from 17(18)-Epoxy-Eicosatetraenoic Acid, a Cytochrome P-450 Metabolite of Eicosapentaenoic Acid", Biochemica et Biophysica Acta, 1992, 1126, 261-268. Toshiharu Yoshino, Sentaro Okamoto, Fumie Sato, "Highly Efficient Synthesis of 13-Dehydroprostaglandins by 1,4-Addition Reaction of Alkynyl　omega Side-Chain Unit onto Cyclopentenone Framework",J. Org. Chem., 1991, 56, 3205-3207. Sentaro Okamoto, Toshiharu Yoshino, Fumie Sato, "A Practical Synthesis of the omega Side-Chain Unit Present in Mexiprostil and Its Use for Synthesis of Mexiprostil via Two-Component Coupling Process",Tetrahedron: Asymmetry, 1991, 2, 35-38. Hiromi Tsujiyama, Naoya Ono, Toshiharu Yoshino, Sentaro Okamoto, Fumie Sato, "A Highly Practical Synthesis of Natural PGE1, delta2-Trans-PGE1 and 2,2,3,3-Tetrade-Hydro-PGE1 via Two-Component Coupling Process Using Zinc-Copper Reagents",Tetrahedron Letters, 1990, 31, 4481-4484. Sentaro Okamoto, Yuichi Kobayashi, Fumie Sato, "A Highly Efficient Synthesis of Natural PGE3 and 5,6-Dihydro PGE3 via Two-Component　Coupling Process", Tetrahedron Letters, 1989, 30, 4379-4382. 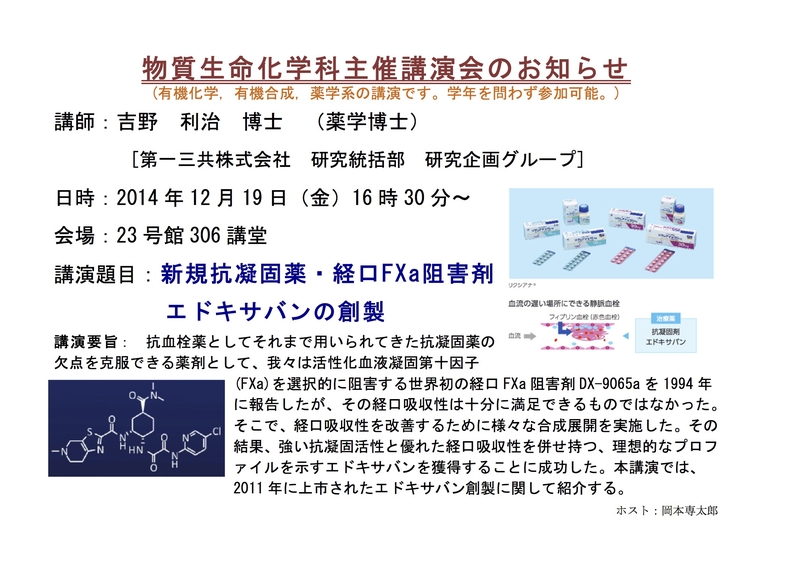 OKA Laboratory HP since 2013-08-03 / Copyright 2013 Okamoto Laboratory, Kanagawa University. All Rights Reserved.